Rome is a very walkable experience for people with a good pair of walking shoes others should take the excellent public transport service , tram, metro or bus provide a very good service. [but look out for pickpockets], and bikeable ones too, or you could do like the locals do and rent a scooter, especially if you're fond of Ben Hur-style chariot racing. Apart from the vast numbers of lovely piazzas [as in square, not thin crust], Roman relics and gorgeous churches you will want to see at least the mega-rich, independent state of the Vatican, including Michaelangelo's Sistine Chapel, the Colosseum, the Forum, the Spanish Steps, Trevi Fountain [try it at night], the Pantheon [built by angels according to Michelangelo], Piazza Navona ringed by baroque palaces, Campo dei Fiori open air market, and the Trastevere area. You would need a month or more to see everything so best do a list of your "Must sees"
Sightseeing Overview: There is simply too much to see in Rome – the Vatican City alone can easily swallow up an entire weekend. Most visitors are overwhelmed and remain torn between running from sight to sight in order to ‘do’ everything or lingering over a couple of monuments and museums. The latter option is strongly recommended – even then, it is best to punctuate cultural trips with ice creams, coffees and serene walks in the city’s parks (the Villa Borghese is one of the loveliest). As for most holy sites, clothing that covers up midriffs, shoulders and legs is recommended, particularly for the Vatican. The centro storico is the obvious starting point, with the greatest concentration of classical and Christian sites enclosed in a relatively small space. Stumbling upon ancient frescoes, Renaissance fountains and beautiful piazzas are part of the pleasures of wandering around Rome’s streets. Rome has over 400 churches and four major basilicas – St Peter’s, St John Lateran, St Mary Major and St Paul’s. However, it is San Clemente – on Via San Giovanni in Laterano – which encapsulates the multi-layered labyrinth of Rome. 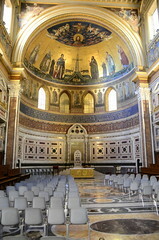 At street level, there is a 12th-century basilica with beautiful mosaics. Down one level is a well-preserved Roman basilica. Deeper still are more ancient Roman remains, until finally, at the deepest level, is the temple to the oriental cult of Mithras. The Ministry of Culture organises the Settimana dei Beni Culturali (Cultural Week; tel: (06) 67231; website: www.beniculturali.it), which is usually held in late March or early April and allows free entry to all state-owned museums, public monuments and excavation sites. Tel: (06) 488 991 or 3600 4399 (call centre). Fax: (06) 481 9316. Other APT branches are at Termini station and Fiumicino airport and there are ten other green tourist information booths dotted around the city in strategic points (open daily 0930-1930). Another useful source of information is the Anglo-centric Enjoy Rome, Via Marghera 8A (tel: (06) 445 1843; website: www.enjoyrome.com), near Termini station. The Ente Nazionale per il Turismo (ENIT), Via Marghera 2 (tel: (06) 49711; website: www.enit.it), provides information on Italian areas outside of Rome and the Latium region. There are various tourist passes available. Roma Caput Mundi, Piazza di Trevi 86 (tel: (06) 678 6136; website: www.romacaputmundi.it) run the Itinere Card, which is a booklet of tickets providing admission to a number of less known museums and archaeological sites – including Capitoline Museum, Forum of Trajan and Trajan Markets, Circus of Maxentius, City Museum of Modern and Contemporary Art, Museum of Roman Civilisation and Museum of Folklore. The pass, valid for a week, costs €12.91 and can be purchased from Roma Caput Mundi. Roma Vision (tel: (06) 4695 4695; website: www.romavision.it) has now introduced a card called ReadyRoma. The one-week pass costs €41 and includes the Itinere Card, a tour by boat, a ride on a historic tram and two passes for buses that cover the city’s most interesting sites, including the catacombs on the Via Appia. They also offer cheaper one-day options. Cards are available from Roma Vision, who have stands at Termini station, Piazza del Colosseo, Piazza Santa Maria Maggiore and Piazza San Giovanni. Two other passes are the Museum Card and the Archaeological Card (tel: (06) 3996 7700, information). The first allows entrance to the National Roman Museum’s four sites – Palazzo Massimo alle Terme, Palazzo Altemps, Baths of Diocletian and Crypta Balbi; the second allows entrance to those sites plus the Colosseum, the Palatine, the Baths of Caracalla, the tomb of Cecilia Metella and Villa dei Quintilli. The passes cost €9 and €20 respectively and are valid for seven days from the first day of use. They can be purchased from any of the participating monuments or museums.